Famous for their ability to add a burst of freshness to any dish, sweet or savory, citrus fruits including lemons and oranges are well-known for their many health perks. The most pronounced of these is their high concentration of immune-boosting vitamin C.
We have written quite a bit about various citrus fruits, including the many benefits of drinking warm lemon water in the morning. While citrus fruits are very popular, and are widely embraced by many home cooks, too many of us are still throwing away the peels. This is unfortunate because much of the antioxidant content of these fruits is concentrated in the peel. The following are seven reasons – culinary and other – that you should never throw away a lemon or orange peel again. Use the zest of lemons, oranges and other citrus fruits to flavor your meals. Simply grate the peel and use fresh, or dry for later. Citrus zest tastes amazing in a wide range of dishes – including poultry, fish, pasta, grilled meats or vegetables, salads, soups, stews … the list goes on. In order to avoid any unwanted pesticides, always choose organic citrus. Not only does it taste great, it provides you with fiber, antioxidants and essential oils. One of the main antioxidant groups found in citrus is known as limonoids. Limonoids have been linked to combatting many forms of cancer, including breast, mouth, lung and colon cancers. Note: If you have any kidney or gallbladder illness, ask your doctor before enjoying citrus zest. Add a few organic orange or lemon peels directly to your bottle of organic, extra virgin olive oil. The longer the rind sits in the oil, the more it will become infused with the citrus flavor. This will add an exciting dimension when you drizzle it onto fish dishes and salads before you serve. You could also experiment with using it in your next batch of hummus. After you squeeze your lemon or orange, you can rub the inside of the peel directly on your skin. This will tighten your pores and serve as a toner. As it is more acidic, lemon will be more potent, while orange will be milder. Rinse well after applying to your skin. Simmering a large pot of water, and adding some lemon and/or orange peels can instantly make your kitchen – likely your entire home – smell fresh. If you keep it simmering on the heat for a while, the steam will also add some humidity into dry, stale air. Many types of insects are naturally repelled by citrus peels. Slicing lemon peels and using them to line the doors to your home which lead outside can help keep ants from entering. If they are already inside and congregating in specific areas of your home, simply leave some lemon peels there, too – they will likely evacuate quickly. For garden slugs, a layer of orange peels over the soil can help deter them. Orange peels can also help keep mosquitos away; simply rub the inside of a peel on your skin. Note: Do not rub citrus on exposed skin before going into direct sunlight. 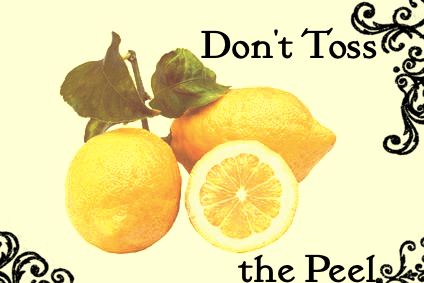 Keeping a few citrus peels in your trash cans, underneath the bag, can help to combat nasty garbage odors. Similarly, if your garbage disposal smells, running a few lemon or orange peels through can quickly neutralize the stink. If the chrome in your kitchen is looking less than shiny, simply rub with a lemon rind, then rinse and buff with a cloth. This can also be effective for a stainless steel sink. The above options are just a few of the vast uses for citrus peels – they can be handy nearly everywhere, and absolutely do not belong in the trash! Hey Buddy!, I found this information for you: "7 Cool Ways to Use Lemon and Orange Peels". Here is the website link: https://www.thealternativedaily.com/7-cool-ways-use-lemon-orange-peels/. Thank you.